Can you afford the high cost of misalignment? It has been documented that 50% of premature machinery failure can be directly attributed to misalignment. This means that by aligning your equipment you will save not only down time and power consumption but your seals, shafts, bearings and couplings will last longer and your machinery will run quieter and vibrate less. 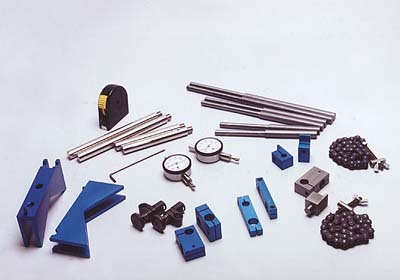 Mr. Shims alignment system will assist you in reaching the tolerances you need for the successful installation of your equipment. The initial installation of machinery is the cornerstone of any predictive maintenance program. It has be done right the first time. With coupled driven machine units the shafts have to be precisely aligned, a soft foot correction made, plus a thermal growth calculation considered before you can achieve an acceptable installation. You need the right tools to do the job. Without the right tools and training your technical staff may be just guessing at how much shim they need to make an adjustment. The power savings alone will justify the cost of the equipment. 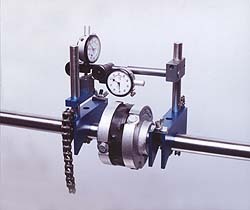 Mr. Shims alignment system is designed for both Rim & Face and Reverse Dial methods of shaft alignment. The v-block mounting clamps are 7/8" wide and supplied with chain to accommodate shafts from ½" to 4". With additional chain it can be mounted on shafts over 10". 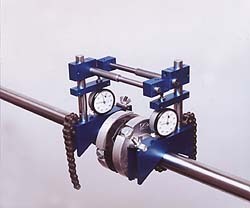 The minimum swing radius when mounted on a 1" shaft is 5-3/8". 2ea - Cross Span rods 6", 8", and 10"
1ea - Cross Span rods 6", 8", and 10"
Using your own dial indicators, dial Indicator we use is a LS Starrett, 81-141J. The mounting diameter (stem) on this is 3/8" (.375"), the rod diameter is 5/16" (.3125").